Size: Length: 33cm (13 inches), Width: 4.59cm (1.8 inches), Height: 0.25cm (0.1 inches). 【Japanese 67 Layers VG-10 Stainless Damascus Steel】VG-10 - Made up of Carbon: .95 - 1.05%, Vanadium: .10 - .30%, Chromium: 16.10 - 18.50%, Molybdenum: .90 - 1.20%, Cobalt: 1.30 - 1.50%, Manganese: .50%, Phosphorus: .03% This is the most popular stainless steels amongst Japanese knife makers. While other damascus knifes only have fewer Chromium(14.05-16.50) and No Cobalt. 【Multi-purpose Kitchen Knife 】The damascus chef's knife is multipurpose for cutting, dicing, slicing, chopping as well as mincing. The knifes edge is more durable and stronger so you can effortless slicing of meat, fish, sushi, vegetable, fruit and so on, bringing excitement back to cooking. 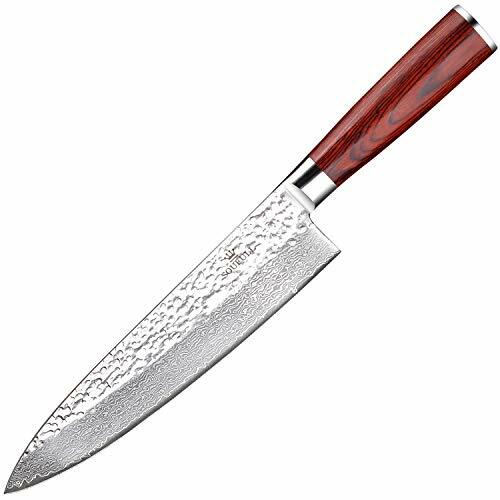 【ANTI-CORROSION】This 8-inch chef knife has better edge retention and is very wear and corrosion resistant compared other normal damascus knifes. As this slicing knife includes 16-18% chrome in the blade's metal composition which ensures it will not fade or tarnish even after using it for a long time. 【Superior Pakka Handle】 The superior Pakka wood is largely waterproof compared with normal pakka wood, and it's known for the comfort, strength and stability, as well as feels soft and comfortable. It can minimize any fatigue, finger numbness or aches after holding long time. Color: This VG-10 damascus chef's knife is multipurpose for cutting, dicing, slicing, chopping as well as mincing. The knifes edge is more durable and stronger so you can effortless slicing of meat, fish, sushi, vegetable, fruit and so on, bringing excitement back to cooking.